One of the most vexing of FCP issues in recent months has been with FCP 7.0.2. It would have affected anyone who made subtitles in FCP and exported an XML for creating an STL for DVD Studio Pro, or like me, to do XML manipulation to do global changes in subtitles. What happened was that ALL the line breaks were lost. Really frustrating leading to a workaround consisting of reinstalling a 'ghost FCP 7' and running that for making XMLs. This update has fixed the 'lost line breaks in XMLs' issue according to the release notes, and added some features. I haven't tested all the apps yet and will install this first on a non-production system to check if anything else has been broken. More on the updates as I get some hands on time with them. Real-time compatibility with Sony XDCAM HD422 720p24/p25/p30. XML export now retains the carriage return when working with text and third-party applications. Localized versions of Final Cut Pro now recognize HDV devices that use the 1080i60/1080i50 FireWire Basic Easy Setups. Corrupted display of the camera controls with certain graphics processors. Adds a compression setting optimized for iPad and iPhone 4. I'm not at IBC this year due to some earlier commitments of the domestic kind. Avid released a software version of DS. This will have all the features of a 'real DS' including HD, 2k, 4k, conforming and finishing. Anyone who has relied upon Avid's media management, conform, relink, decompose, consolidate, will have a respect for this software over any other. Even Smoke. It will be available in October for US$ 10,000 which should price it lower than Smoke on Mac. And it has more features than Smoke on Mac plus close integration with all Avid products especially Media Composer and ProTools which Smoke does not do. Note that DS works on Windows and Smoke on Mac (and Linux). Maybe you might be able to run both on a Mac, with DS running under Parallels. Speaking of Smoke, Autodesk announced 'Flame Premium' - the MS-Office for online work. This is a suite consisting of Autodesk Smoke, Flame and Lustre as one package. I have no idea on price or shipping, but this can be lethal if Autodesk markets it correctly. And if studios can get people to run all three. Let's wait and see. Panasonic showed a 'DSLR killer' camera the AG-AF101. DSLR size sensor, compatibility with film lenses, no aliasing issues. Can run Canon and Nikon lenses with an adapter. HD-SDI output too so you can record to HDCamSR tape or KiPro if you don't like the compression they are using. Available December for Euros 5000, this might prove to be a Red killer rather than a DSLR killer. Aja also announced a smaller Ki Pro the Ki Pro Mini. It records any HD-SDI or HDMI signal as Apple ProRes HQ, SQ, LT, or Proxy files. To CF cards. its small and can mount like Anton Bauer battery packs to the rear of most cameras. Available October for US$ 2000. Aja also introduced an evolved Kona3, the Kona 3G that adds support for 3D over HDMI and many other I/O capabilities. This will be priced lower than the Kona 3 and available in October. US$ 2400 with the break out box. Not to be outdone, Blackmagic came out with their evolved Blackmagic Decklink Extreme HD in the form of a Decklink Extreme 3D+. This too offers 3D easily over HDMI 1.4 on TV sets that support this standard. HDMI 1.4 allows full resolution HD 3D over one cable rather than the side-by-side that HDMI 1.3 offered that had only half HD resolution. Decklink's Extreme 3D+ will go for only US$ 1000. And its available now. In the US, of course some snoots will continue to swear by Aja. But in years of using both, I can't see what's so special with Aja cards over Decklink and I haven't come across any scientific study that proves one is better than the other. Though Decklink have been more cost effective. And have had vastly better support in India. Blackmagic is also shipping the Resolve on Mac... finally. US$ 1000 for a full featured DI grading software that can run on a properly equipped Mac and co exist with FCP on the same system. It will work with the Tangent Wave panel. They have a configuration guide at their site which should make it easy for anyone to set it up. And this guide will ensure that anyone and everyone sets one up. With interesting results. The same Resolve Mac system could well have supported an Autodesk Smoke. Since both Resolve and Smoke use the Nvidia FX 4800 for their GPU work. Except that Autodesk Smoke needs a Aja Kona 3 card, while the Resolve uses a Blackmagic Decklink HD. Too bad. Maybe this will change some day. This is the news at the end of 12 Sep. More surprises could be lurking in the shadows. or maybe even after IBC. I will be looking out. 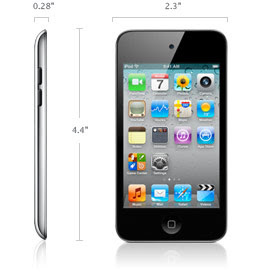 If you've been waiting to buy an iPhone 4 or an iPad, do head over to Apple's web site and take a look at the new iPod Touch. Announced at a special event by Steve Jobs himself. and available now. No unlocking no jailbreaking. Works over wifi. It doesn't have GPS, but does an approximate map location based on wifi location. Just like on an iPad non-3G. Another announcement last night was that iOS 4.1 will solve some bugs of slow performance on the old iPhone 3G. And iOS 4.2 will offer new features to iPads and multi-tasking and bring all iPhone devices to a common OS. Available in some months. 120 million iPhone devices - iPhone 2G, 3G, 3Gs, 4, iPad, iPad G, iPod Touch - sold so far. A new AppleTV was announced too. Is just $100 but has no storage. Only streaming. With Internet speeds like we have in India, it might be challenging to watch movies online, except for YouTube. Of course if you have another Mac in the house, this is a great device to watch your movies and photos on your TV set. over wireless.